Ah JB, you truly are the cheeky little schoolboy of Australian retail. 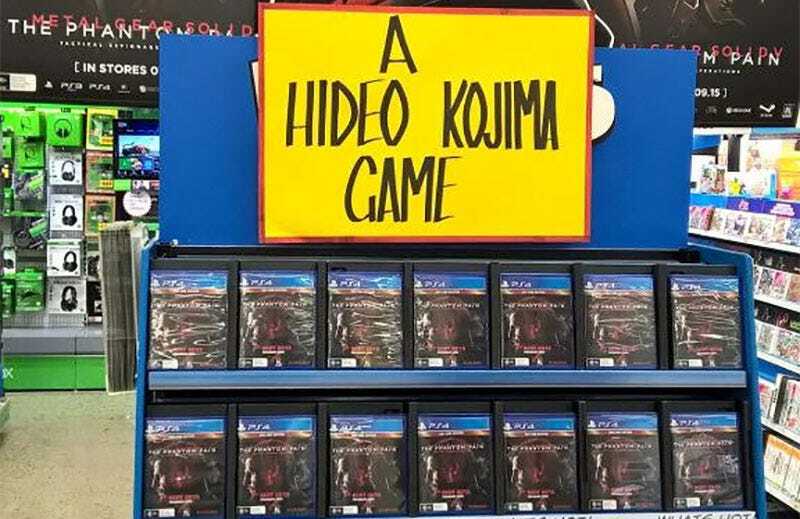 First it was your incredible in-store reviews, now it’s stores throughout the country taking sly potshots at Konami’s decision to remove Hideo Kojima’s name from the cover of Metal Gear Solid V: The Phantom Pain. Thanks for the reminder JB. Just in case everyone has forgotten — Metal Gear Solid V: The Phantom Pain is indeed a Hideo Kojima game. For the uninitiated: Kojima’s name is usually plastered all over Metal Gear Solid promotional material but this time, in the midst of a split with Kojima productions, Konami has been removing his name. Some fans are a little upset about this. Including, it seems, a JB Hi-Fi employee who let rip with a subtle jab at Konami. Kojima himself retweeted this original post and it has taken on a life of its own. This particular photo was taken at the JB Hi-Fi in Chatswood Westfield but it’s merely one of many. JB Hi-Fi stores throughout Australia are taking up the cause. Have you seen any others in the wild? Shoot us an email.